Low value Mai 1 Fuang EF about 47,000 - 50,000 baht. 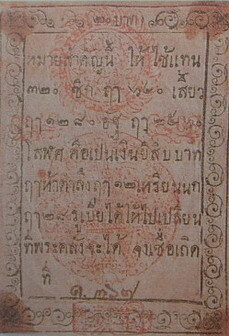 His Majesty King Mongkut (King Rama 4) launched the paper money called Mai or Warrants to be used along with Pod Duang (silver bullet money) in 1853. They were printed from the Royal Printing Works in the premise of the Royal Palace. 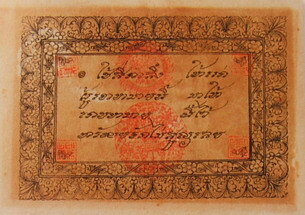 Mai were issued in many different values reflected the King's intention to make them work in commonly used. The face value is expressed in 12 languages; Thai, Chinese, English, Latin, Hindu, Malay, Khmer, Burmese, Mon, Laotian, Bali and Sanskrit to serve all races whose lived in the kingdom. There are 3 types of Mai that are divided by amount of value. All of them were printed on white paper. 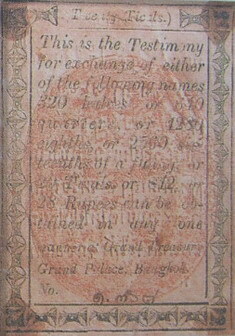 Text and decorated frame were printed with black ink. 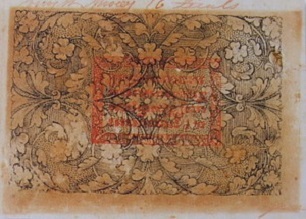 The royal insignias were printed with red ink. Although Mai were highly promoted to become commonly used, people still preferred Pod Duang. Whenever they got any Mai, they would quickly changed Mai into Pod Duang at the Royal Treasury Department. There was no evidence of duration of Mai in circulation. Low value Mai were printed vertically and issued in 8 denominations; Fuang (1/8 Baht), Salung (2/8 Baht), Salung Fuang (3/8 Baht), 2 Salung (4/8 Baht), 2 Salung Fuang (5/8 Baht), 3 Salung (6/8 Baht) 3 Salung Fuang (7/8 Baht) and 1 Baht. The price value was printed on both sides. In addition, the red lotus mark on the top of front side represents the number of Fuang. For instance, 1 Fuang Mai has 1 red lotus mark. The embossed mark also were used for the impaired sight. 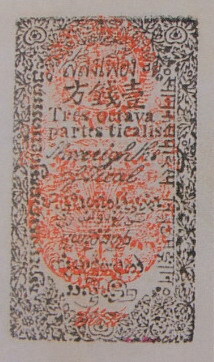 The number of embossed mark at the top also represent the number of Fuang. 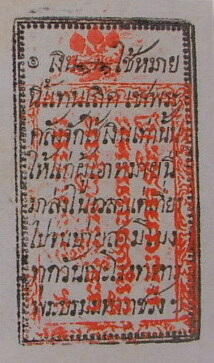 Medium value Mai were printed horizontally and issued in 4 denominations; 3 Tamlung (12 Baht), 4 Tamlung (16 Baht), 6 Tamlung (24 Baht) and 10 Tamlung (40 Baht). The number of red Chinese word "Fu", meaning to protect or to guard were stamped at the front side represented the number of Tamlung. High value Mai were printed vertically and issued in 2 denominations; 20 Baht and 80 Baht. There is serial number at the lower middle on both sides.